Miguel Gregorio Antonio Ignacio Hidalgo y Costilla Gallaga Mondarte Villaseñor (May 8, 1753 – July 30, 1811), also known as Cura Hidalgo ("Priest Hidalgo"), was a Mexican priest and revolutionary rebel leader. He is regarded as the founder of the Mexican War of Independence movement; who fought for independence against Spain in the early nineteenth century. The state of Hidalgo in Mexico is named after him. Hidalgo had a passionate commitment to freedom for his people but also for social justice, hoping that the post-independence society would be much more egalitarian than the colonial reality. He took practical steps to improve the economic conditions of the poor, turning his own house into a night school for local artisans. He started a pottery factory, ran a leather curing process, grew mulberry trees for the nourishment of silkworms, cultivated vineyards and olive groves, and established workshops for carpentry, harness making, blacksmithing and weaving wool. These activities themselves attracted the hostility of the Spanish authorities. He also worked to improve the conditions of Mexico's indigenous peoples, whose rights would hardly change at all after independence. Unfortunately, the Revolution did not result in radical changes in the Mexican economy, which continued to be dominated by ten percent of the population and power would reside in the hands of an elite, not with the majority of the population. Although he saw himself more as a general than as a priest, and broke his vows of celibacy, he did not engage in violence for the sake of violence but for the sole purpose of throwing off tyranny. Indians and those of mixed descent were among his strongest supporters and as long as he was leading the revolt it represented a rising up of the underclass against the privileged and powerful. Sadly, he was caught and shot as a rebel. Hidalgo was born on the Corralejo hacienda near Pénjamo, Guanajuato, on May 8, 1753. He was born into a middle-class criollo family (historically, any Mexican of unmixed Spanish ancestry). Growing up in a hacienda, where his father Cristóbal Hidalgo y Costilla was employed as a superintendent, Hidalgo developed an early sympathy for the unskilled Indian workers. His mother, Ana María Gallaga y Villaseñor, married Cristóbal on August 5, 1750; Miguel was their second of five sons. Miguel was reportedly a keen reader of banned French literature and an avid nonconformist. Though he trained as a priest, he retained an interest in political and social questions, which he carried with him to his first parish in the town of Dolores, now called Dolores Hidalgo, in the modern-day central Mexican state of Guanajuato. He learned several indigenous languages, wrote texts in the Aztec language and organized the local communities in Michoacan. Sent to the Colegio San Nicolás in Valladolid, Hidalgo received his bachelor's degree in theology in 1773 and was ordained in 1778. It is impossible to say exactly when Hidalgo turned his thoughts towards rebellion against the colonial power, but the break is thought to have come sometime after Joseph Bonaparte replaced Ferdinand VII on the throne of Spain. This was one of the decisive moments in Mexican history, breaking a political link that had united the country with Spain for three hundred years. Literary clubs began to emerge, expressing a whole range of radical views, united by a general discontent against the new political realities in the Spanish Empire. Hidalgo, a priest of unconventional views, attended one such provincial group in Guanajunto. It was there that educated criollos started conspiring for a large-scale uprising of mestizos and indigenous peasants. The indigenous peasants were at the bottom of a social ladder that exploited and abused them. Hidalgo and Allende had originally planned the rising for December 8, 1810. But there were leaks among the conspirators and plans for the rebellion were sniffed out by the magistrate of Querétaro. Fortunately for the conspirators, his wife, Josefa Ortiz, was a strong supporter of the rebellion. Though the magistrate locked her in her room, she signaled her next door neighbor, Ignacio Pérez, to come over. Through the keyhole she told Pérez, a fellow conspirator, that her husband planned to arrest Allende. But Allende had already left to confer with Hidalgo and decide what to do to meet the emergency. The result was Hidalgo's famed grito ("shout") from his pulpit at 11 p.m. of September 15. Though the grito is hailed today as a declaration of independence from Spain, in reality it was a declaration of defiance against Joseph Bonaparte and the Spaniards resident in Mexico as well as a declaration of allegiance to the very undeserving Ferdinand VII. Gathering together a Peter-the-Hermit force that was as much a mob as an army, Hidalgo and Allende at first swept everything before them. Gathering adherents like a snowball rolling downhill, this mob-army numbered several hundred when it captured San Miguel (today San Miguel de Allende), 6,000 when it entered Celaya, 20,000 when it rolled into Guanajuato, 50,000 when it overran Valladolid and 82,000 as it engulfed Toluca and menaced Mexico City. Though Hidalgo and Allende were excommunicated September 24 by the bishop of Michoacán, this didn't seem to bother a man who seemed daily to be thinking of himself more as a general than as a priest. On October 19, as his large but ragtag force was preparing to march on Mexico City, Hidalgo was named generalissimo of all rebel forces and outfitted with a garish blue, scarlet, black and gold uniform that made him resemble a Roxy usher. Hidalgo's peasant army, in the tradition of the jacquerie of fourteenth-century France, settled scores against the ruling elite with vengeful brutality. San Miguel, Celaya and Guanajuato were all sacked, with peaceful citizens the victims of mob violence. In Valladolid, the courageous canon of the cathedral went unarmed to meet Hidalgo and exacted a promise that the atrocities of San Miguel, Celaya and Guanajuato would not be repeated. The canon achieved a partial victory. Though wholesale destruction was not repeated, Hidalgo was furious when he found the cathedral locked. (He had wanted to say a prayer of thanksgiving.) So he locked up all the Spaniards, replaced city officials with his own and looted the city treasury before marching off toward Mexico City. While Hidalgo didn't order the violence, he seems to have been powerless to control it. This brought him into conflict with Allende, a disciplined and orderly professional. Friction between the two started as early as the initial engagement at San Miguel. When a mob ran through the town, Allende tried to calm its members down by striking at them with the flat of his sword. This brought a rebuke from Hidalgo, on grounds that Allende was mistreating the people. This was the first of many quarrels, disputes that would inevitably take their toll. Hidalgo, in truth, was even less qualified to be a general than he was to be a priest. With Mexico City almost in his grasp, he inexplicably turned back toward Guadalajara. His army began to melt away and was down to about 40,000 when he was defeated at Aculco on November 7 by the able royalist general Felix Calleja. However, Hidalgo entered Guadalajara in triumph and was able to raise his force to 100,000. All the city's dignitaries and officials still believed that Hidalgo represented the wave of the future. The excommunicated priest was hailed as a liberator, fiestas were given in his honor and he was accorded the title of Supreme Highness. All the while, Calleja was marching on Guadalajara. Against Allende's advice, on January 14, 1811, Hidalgo concentrated his entire force at Calderón bridge at the eastern outskirts of the city. There the bunched up peasant army was systematically butchered by Calleja's smaller force of seasoned campaigners. Particularly damaging to Hidalgo was the fact that a royalist canon ball hit his munitions dump and set off a holocaust behind the lines. Calleja, with an enhanced Royal army, followed in close pursuit, finally forcing Hidalgo and Allende to make a stand on the banks of the Calderon River, where a battle was fought on the morning of January 16, 1811. Although numerically weaker, Calleja's force was far better armed. Hidalgo, moreover, had organized his own forces badly, ignoring the advice of the more experienced Allende. Under sustained attack by cavalry, infantry and artillery, the rebel army collapsed in panic when one of the Royalist shells struck an ammunition wagon. Calleja's victory was complete. Allende, who had grown increasingly frustrated with Hidalgo during the campaign, a mood that was compounded by the murderous indiscipline of the Indian army, promptly relieved his chief of command, and carried him northwards with his tiny remaining force, towards the American border, where he hoped to gain the help and support of President James Madison. However, on March 21, he was intercepted by Royalist forces, and the two leaders taken prisoner. The four leaders of the revolution—Hidalgo, Allende, Jiménez and Aldama—were held in the Federal Palace of Chihuahua and executed by firing squad, three of them on June 26, 1811, and Miguel Hidalgo on July 30, 1811, at Chihuahua's Government Palace. Prior to his death, Hidalgo expressed regret for the bloodshed unleashed by the revolt, though he remained firm in his conviction that Mexico had to be free. The corpses of the four leaders were decapitated and their heads were put on the four corners of the Alhóndiga de Granaditas in Guanajuato, intended as a way to intimidate the insurgents. Because he was a priest, albeit an excommunicated one, Hidalgo was turned over to the bishop of Durango for an official defrocking. On July 30, 1811, he was shot in Chihuahua. With a gallantry that impressed all, Hidalgo calmly instructed members of the firing squad to aim for the right hand that he placed over his heart. Hidalgo's decapitated body was disinterred from his burial place in the San Francisco Temple in Chihuahua and re-buried in Mexico City after independence had been won. 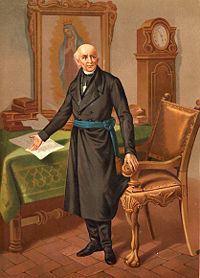 Miguel Hidalgo y Costilla had the unique distinction of being a father in three senses of the word: a priestly father in the Roman Catholic Church, a biological father who produced illegitimate children in defiance of his clerical vows, and the father of his country. Though Guadalupe Victoria was, like Washington, his country's first president, Hidalgo was, like Washington, the man who launched a colonial independence struggle against a European mother country that had become excessively oppressive. He has been referred to as the father who fathered a country. Hidalgo never took his priestly vows too seriously. He fathered two daughters out of wedlock, read the anti-clerical works of the French Encyclopedic philosophers and seemed to regard the Church as a sort of sinecure which would provide him with a regular income. Among classmates he was known el zorro, "the fox." Hidalgo's two outstanding characteristics were as an entrepreneur and a humanitarian, with the roles inextricably intertwined. After ordination, he steadily mounted the hierarchical ladder, each time serving in a richer and more desirable parish. In 1803, at the age of fifty, he arrived in the Guanajuato town of Dolores accompanied by an entourage that included a younger brother, a cousin, two half sisters and two illegitimate daughters. His elder brother, a man of influence, had helped him attain this coveted parish, which brought in between eight and nine thousand pesos revenue annually. Once ensconced in Dolores, Hidalgo turned over most of the clerical duties to one of his vicars, Father Francisco Iglesias, and devoted himself almost exclusively to business, intellectual pursuits and humanitarian activity. In a strenuous effort to improve the economic well-being of his parishioners, Hidalgo turned his house into a night school for local artisans. He started a pottery factory, ran a leather curing process, grew mulberry trees for the nourishment of silkworms, cultivated vineyards and olive groves, and established workshops for carpentry, harness making, blacksmithing and weaving wool. Hidalgo's political and intellectual growth was nurtured by membership in the literary societies that were so prevalent in colonial Mexico in the early nineteenth century. These literary circles, which soon became political circles, were the true incubators of the independence movement in Mexico. Hidalgo's impulse toward freedom for his people was also fed by a strong egalitarian instinct. At both Dolores and San Felipe, his previous parish, Hidalgo opened his house not only to Frenchified creole intellectuals from whom he derived many of his ideas but also to downtrodden Indians and mestizos. It was Hidalgo's empathy with the masses that would be both his great asset and fatal flaw once the independence movement got started. An intellectual comrade—later to become a comrade in arms—was a young captain named Ignacio Allende. Allende headed one of the political-literary circles in Querétaro and he and Hidalgo soon became active co-conspirators against Spanish rule. This spirit intensified in 1808, when Napoleon installed his brother Joseph as king of Spain. Though the rebellious creoles in Mexico shared with Napoleon the ideals of the French Enlightenment, they believed that by now Napoleon had become a power-hungry despot and they had no wish to pledge allegiance to his brother. So they originally rallied to the cause of the deposed Bourbon king Ferdinand VII, who later turned out to be an ultra-reactionary. ↑ Caruso, John Anthony 5. Denness, Gary. Greatest Ever Mexicans - No. 7. The Seventh Greatest Mexican - Miguel Hidalgo Retrieved March 5, 2008. History of "Miguel Hidalgo y Costilla"